The heartland of Southeast Asia has always been viewed as exotic by the early Western travelers and explorers. The Laotian people have a tradition of silver-working; their designs are influenced by the cultures of Tibet, China and India. The main forms of expression in jewelry go back to the introduction of Buddhist sculpture in the 7th century and are thus linked to religious and ceremonial rites. 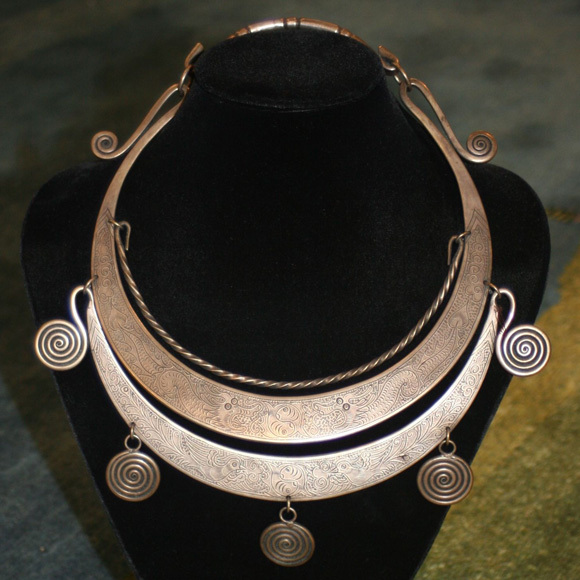 The hill tribes, including the Meo, who made this jewelry, have used silver as currency, dowry and a symbol of status. To this day, they trade with silver bars and balls and wear this jewelry to demonstrate their wealth.